The Dfam consortium is excited to announce the release of Dfam 3.0. This release represents a major transition for Dfam from a proof-of-concept database into a funded open community resource. Central to this transition is a major infrastructure and technology update, enabling Dfam to handle the increasing pace of genome sequencing and TE library generation. Equally important, we merged Dfam_consensus with Dfam to produce a single resource for transposable element family modeling and annotation. In doing so, Dfam serves the needs of a broader research community while maintaining a high standard for family characterization (seed alignments), and TE annotation sensitivity. Finally, and most importantly, we are working on making Dfam a community driven resource through the development of online curation tools and direct user engagement. Dfam has undergone a major infrastructure upgrade since the last release including faster servers and storage systems, a new software stack and improved website features. Together these updates will allow Dfam to greatly expand the number of families and the species represented. The new software stack includes a publicly accessible REST API, which provides the core functionality used by the redesigned dfam.org website and is available for use in community developed applications and workflows. The new website is based on the Angular framework, supporting both a traditional web portal to the Dfam database as well as the use of interactive tools for data management and curation. The merger of Dfam_consensus with Dfam created a combined database of 6,235 TE families in 9 organisms, each characterized by a seed alignment of representative family members. Seed alignments constitute a rich dataset for generating sequence models such as consensus sequences, or profile Hidden Markov Models (HMMs). Consensus sequence databases have traditionally not preserved the sequence alignment from which the consensus was generated. This omission has made it difficult to evaluate the strength of the consensus, to make incremental improvements by adding/removing members, or to regenerate models using improved methodologies. By adding support for consensus sequences to Dfam, the provenance is preserved in the seed alignment. In addition, the positions within the consensus can be directly related to the corresponding match states within the profile HMM. The new Dfam website contains several features borrowed from Dfam_consensus including: the seed alignment visualization, the TE classification system and visualization, and per-family and full-database EMBL exports for consensus sequences. 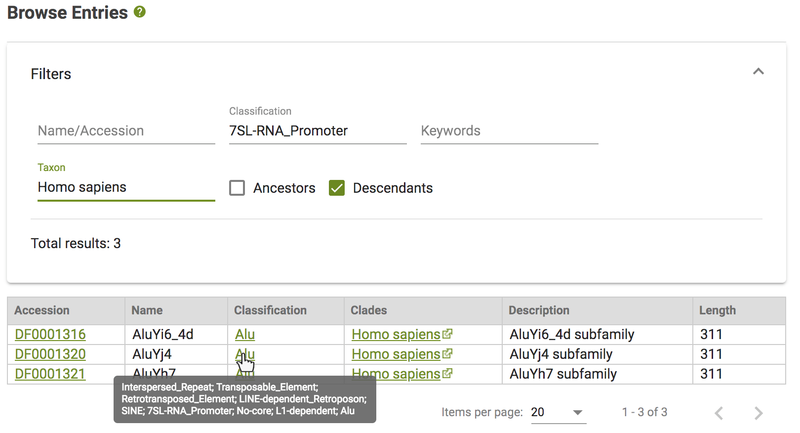 In addition, we have improved the family browsing interface, and added the ability to store/visualize family features such as coding sequences, target site preferences, binding sites, as well as ad-hoc sequence annotation. Dfam has adopted the recently developed (for Dfam_consensus) classification system for repetitive sequences and applied it to all of the Dfam-2.x families. This system combines concepts from established systems (Wicker et. al., Piegu et. al., Curcio et. al., Smit et. al., and Jurka et. al.) with phylogenies based on reverse transcriptase and transposases. Classification names were chosen to be as descriptive as possible while still honoring the most widely used acronyms for well-defined classes. We are embarking on an effort to greatly expand the database using de-novo repeat identification pipelines, data sharing with other open-databases, and most importantly from direct community submissions. If you have existing TE libraries or plan to develop one for a newly sequenced organism, consider making it a part of the Dfam database. We can offer assistance with importing legacy datasets and are working on tools to facilitate direct community curation of the database. Please contact us at help@dfam.org. We are excited to announce the opening of a postdoctoral fellowship within the Dfam project and located at the Institute for Systems Biology (ISB) in Seattle. At ISB, the Smit lab is focused on the study of Transposable Element (TE) biology, and evolution using the latest developments in sequence modeling, phylogenetic reconstruction, and homology detection. We have developed some of the most widely used tools and databases for the study of TEs including RepeatMasker, RepeatModeler, the Repeat Protein Database, and Dfam. The position offers an opportunity to help shape the future of the new Dfam community resource in collaboration with the Wheeler lab at the University of Montana, and through a partnership with the NIH. The project will involve investigating and advancing de novo methods for the generation of TE libraries, development of improved methods for classifying new TE families, design of quality metrics and standards for TE modeling, providing TE family curation assistance to the research community and building/studying TE families in a unique set of newly sequenced species. Applicants should hold (or will shortly be awarded) a PhD degree and have experience in TE biology, and genomics. Prior experience with TE library generation/curation, genome biology, and genome evolution are considered a major advantage. Candidates should have strong communication and data analysis skills, and an established record of principal authorship in peer-reviewed publication(s). The successful candidate is passionate about science, motivated, proactive and able to work in a team. Since its inception in 2012, Dfam has demonstrated the promise of using profile hidden Markov Models (HMMs) to improve the detection sensitivity and annotation quality of Transposable Element (TEs) families in human and subsequently for four additional reference organisms. Despite these advances, the tools used to discover new families ( de-novo repeat finders ), improve families ( extend, defragment, subfamily clustering ), and classify TE families continue to depend on consensus sequence models. This discordance between methodologies is a direct impediment to Dfam’s expansion. Dfam is growing up. This is the first major expansion of the database since it’s inception. We’ve added repeat families from four new organisms: mouse, zebrafish, fruit fly, and nematode. In total, this release includes 2,844 new familes ( 4,150 total ). With Dfam, we are striving to build models of repeat families that yield high sensitivity without undue false annotation. In this release of Dfam, we have improved our model building strategy to reduce the potential for false annotation, especially in the context of overextending alignments around true interspersed repeat instances. We are pleased to announce the release of Dfam 1.3. This release includes almost 200 new repeat families and updates the underlying human genome to hg38. We are pleased to announce that we’ve released Dfam 1.2. This version represents a few important changes from 1.1, including increased sensitivity for many families, a new plot on the model page, and an improved Relationships tab. We are pleased to announce that the Dfam paper (“Dfam: a database of repetitive DNA based on profile hidden Markov models“) is now available in the 2013 NAR Database issue, and has been selected as a “featured article” (meaning the NAR editorial board thinks it is among “the top 5% of papers in terms of originality, significance and scientific excellence”). We are pleased to announce that we’ve released Dfam 1.1. This version represents a few important changes from 1.0, including updated hit results, a new tab for each entry page showing relationships to other entries, and improved handling of redundant profile hits.